Remember all those strikeouts, and times caught stealing? If the new “mental” coach, Andy McKay, gets some buy-in, the Mariners this season will look as if they know what they’re doing. The tumult was reminiscent of the weeks, and even much of the first two years, after Pete Carroll took over the Seahawks. Not only that, listening to McKay and Dipoto talk at the annual media luncheon Thursday, it sounded as if the hires, the plan and the execution came from The Book of Pete. Culture. Communication. Character. Consistency. Goals. Team above all. Not a single advanced metric in that mound of nouns. Nary a deviation from Carroll’s approach that has produced four 10-win seasons in a row, two Super Bowl appearances and one championship. Carroll can claim none of those emphases as unique to him. He does get credit for implementing many of the ideas taken from UCLA hoops coach John Wooden and force-feeding them into a crusty NFL. As will Dipoto when it works in even crustier MLB. The ideas have been around sports a long time. It’s just taken a long time to bubble up to the top. 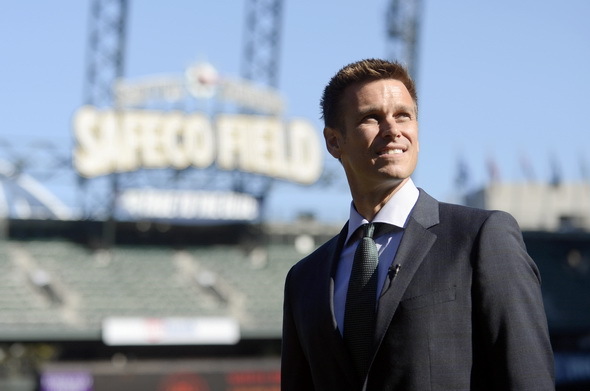 McKay might be the most intriguing Dipoto hire among the many new faces, including players. He’s the guy in charge of getting the most out of each player in the club’s employ. For longtime followers of the Mariners, this news should be accompanied by herald trumpets. No team has quit on so many of its players over so long a time, only to see them blossom elsewhere. In an era of increasing parity, despite the absence of a salary cap, MLB has been unable to drag the Mariners into the playoffs for 14 years. Not only is it the longest baseball drought, it is second only to the NFL Buffalo Bills (1999) in all of major American pro team sports. That is a Berlin Wall-level of resistance to success. McKay’s job: Tear down this wall. It’s not an empty gesture. Players and coaches do it as a learned, positive habit, even when they think there’s no one around to impress. McKay’s job is saddled with the awkward nickname, “mental coach,” which for some us connotes a coach “going mental,” a pejorative that has outlived its usefulness but not its recollection. The time will come in sports when any distinction between mind and body will be greeted with the same bewildered look as “mental coach” is by some now. McKay won’t operate from a distance. Instead he will be in uniform and in the faces of as many players as he can visit, from rookie league to Safeco Field. Carroll has offered up a derisive term that he has heard from skeptics about his methods: Airy-fairy. McKay probably has heard similar things. But Thursday he simplified the goal of his teachings to two words any boss, teacher, parent or spouse can understand. “You can whittle mental skills down to the basic concept of paying attention,” he said. “So when (as a player) I’m doing a drill, my mind is completely consumed with that drill. You teach it through textbooks, you teach it through classroom settings. The concept of clarity of mind and immediate purpose is especially important in baseball, where there is so much more idle time between plays, and so much monotonous routine in the days, weeks and months of a season. I can’t get out of my mind from the 2015 Mariners season when Robinson Cano, of all people, strolled in from third base to home after a walk, thinking he had been forced in when, in fact, the bases were no longer loaded. The tag may have been the worst out in Cano’s mostly illustrious career. The Mariners seemed plagued by unforced mental errors last season. Expanding that to include areas of game judgment, the Mariners were fourth in MLB in strikeouts and second-worst in steal percentage. No wonder one-run deficits seemed like Everest. A mere drift last season toward the major league average in those categories, and the Mariners would have won at least a half-dozen more games. Speaking of wins, Dipoto wasn’t bashful about offering a 2016 target. Even if it’s a standard one for most teams, it’s rare for a Mariners boss to creep out to the edge, knowing the abyss is full of his predecessors. McKay offered up the road map for players. Somewhere, Carroll is dabbing at his eyes and smiling. The Mariners have specialized in turning diamonds into rocks and opportunities into disasters. If Dipoto and his newly assembled team of baseball visionaries can turn THAT around then he and Pete Carroll will own this town. And rightly so. Lincoln just may make this yet again, a bridge too far. Something tells me he has no choice but to let them be. For what, the first three months? If there’s anything we know about Big Town Car it’s that he just can’t handle sitting on the bench. Things change. Losing can do that. For sure, but I also think he must feel some of the sentiment that fans have for (or is that against) him? The only question I have is why he’s still running the show? Is he that much of an egoist, is he really that obstinate, that stubborn? Or as Pete might say, “What’s your deal?”. Yea, yea, yea I think I understand; money trumps everything. It’s “challenging” to support a team that has been losing for so long and is blatantly consumed with bringing in money. I know professional sports is a huge business, I get it. But the Mariner’s seem so soulless, so uninteresting. I gave up caring about them after Dave Niehaus passed away. I used to enjoy listening to him spin his tales regardless of how the team performed… but those days are over. Now, I am indifferent. If I had to go a bit deeper, I might have the mindset of – show me, enough talk – show me. You have no obligation to apologize for your indifference. You earned it. Mariners have to win you back. It hasn’t changed anything since 2001!!! Let’s hope Art, let’s hope. Then they will take five loaves of bread and two fish and feed five thousand. I am very, very interested in seeing the M’s succeed, yet, as with most, I am a Missourian on this one: “Show me”. As the ownership is the exact same, I must have my doubts. Best thing that could ever happen to the M’s is Allen buying them. Now there is a guy who knows how to create a winning organization! As I said above, you’re entitled to keep both eyebrows cocked. Former M’s blossoming elsewhere is a long-standing tradition. Look at the A’s in the late 80’s when they had Hendu, Mike Moore, Rick Honeycutt, Gene Nelson and Matt Young on their roster and won with them. It’s way past time to stop the bleeding on that. Color me disappointed at how many former M’s were in the postseason last year. 85 wins and a top 10 ranked farm system will do wonders for the organization. You’re entitled to every bit of skepticism. But there is a plan here, and proof that it worked in football. We shall see. A couple dozen years ago I threatened to make a t-shirt that read, “Congratulations World Series Mariners!” because so many of our cast-offs were in it. Just not us. I’d need a 6XL shirt to fit all the names today. In small print. Oops, Sir Lord Thiel, sir. Art, I am having a little fun here. Royal Brougham, (did I spell it correctly?) I have insider sources saying he is smiling upon you. May I present an offering to you. One that you might consider forwarding to Andy McKay based upon this another one of your countless scriptural smoken lockdown artifacts? First of all, before the offering, Sir Thiel: “–May the Big Bird fly over your critics with little bombs of sulfuric white ammonia droplets splashing upon their intrepid little bald heads. (one of Johnny Carson misquotes). Now, you know I’m an old white guy in the last stages of some serious dementia. Hey bar-keep Joe, I’ll have another one of those that Jim Moore is having. Keeps those demons away. Ahh, while your at it big bird, drop those little gems over the Go To Guy’s critics heads too, ok? You may want to draft a huge flock for that. Andy, may I suggest you paint the locker room black. (sing it Stones). That will represent times past since “2001, A Space Odyssey.” (farewell Dave, err “–Mr Z to ground control. (opps again, he’s drifted off into space) – “ground control to Mr D–” I’ll have another one of those Joe. Always add value: All is well: Appreciate the moment; Be your best (Joel Olstean $$): Believe you can (copy cat Olstean again, $$$): Believe, achieve, receive; (TellAhVison preachers etal): Can’t stop now (Clinton’s, Bill Cosby): Change is good (Obama): Destiny is mine: (George McFly): Do it (now), (Nike, Jordan): Dreams come true: (Walt Disney): Focus and win (Dr Wayne Dryer): Follow your guts (Marines): Go for it (Rocky Balboa): Have a party (Johnny football): Hope to triumph (Trump): I am great (Ali, Ravishing Rick Rude, Rick Flair, etal): It is possible: [Keep it fun (and) Compete, compete, compete (Pete Carroll)] Keep the faith (Apostle Paul): Ride or die: (Sally Ride): Seize the day (Alexander the Great or Shakespeare? ): Stay the course: Winners Never quite: Losers never win: Yes you can: Make Pete proud: & Remember the Seahawks. (WHAT??? Get that last crap quote outta heah! They didn’t get to the Super Bowl this year). Paul, thanks for your willingness to disclose you are Sarah Palin’s speechwriter. Wow! You’re all so hopey-changey! God bless mama gun-totin’ bears and their cling-on paper daily Constitutionals! Selig heil and stay Deeeeemented! I don’t do hockey. Hockey moms? Not that I know of. Scary – get back on your meds pal. Guessin the beer has been enjoyed thoroughly and in quantity before you posted this. Although the off the charts manic tone brings to mind other substances that are abused, sadly. Was that a Derrick Coleman joke? You, sir, must be from the land of sky blue waters, that is if you’re really old like me. I must admit, I have done some of my best writing when conjuring up memories of what it was like then, cracking open those wonderful cans of those German golden Glukstite suds of yesteryear rated at 20%. Unfortunately, nurse Ratchet forbids any such activities as those on at these facilities. Those other substances you made reference to, well, you’ll have to contact the pharmacist here at the nursing home about those. They give me a little paper cupfull of those every morning, and then I get to use my computer afterwards. They think I’m harmless. “Somewhere, Carroll is dabbing at his eyes and smiling.” Me too. Excellent article! I’ve been saying it for months. Compete Pete like beliefs and concepts have arrived at Safeco. We are saved, we are saved. I have tears in my eyes listening to 2016 thinking that has already been modeled in Seattle by the Seahawks. Embrace the moment. Savor it. From Paying Attention to Can’t bear to look..8 weeks, 10 Weeks..June?